These photos might be the last taken with my trusty, little Canon A430 camera. After two years, 200 blog posts, and far too many snaps than I can count, the camera began displaying the dreaded white horizontal lines, and blindly white out-put. Of course I'm in a bit of a panic. For food bloggers, not having a camera is like a musician giving a performance to an empty theater. At the moment I'm looking for a stand-in camera until I can figure out what to do. Luckily I have a few recipes from the summer that I never got around to uploading. Thank you, laziness. :-) I may use these recipes as Tuesdays with Dorie substitutes, so please bear with me if this month has slim pickings. 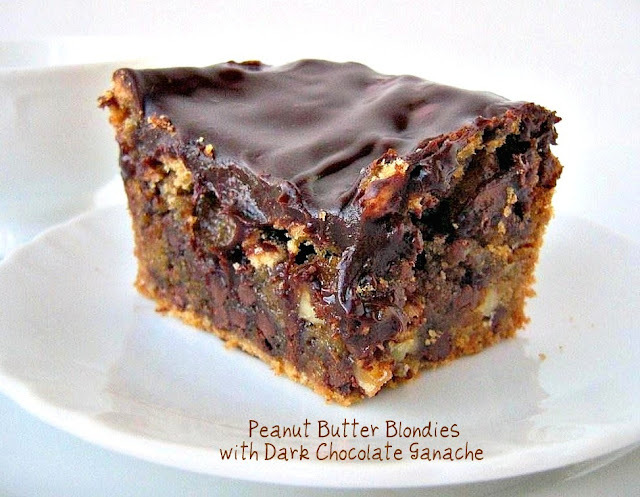 Ok, with that unpleasant business aside...onto these blondies! This weeks recipe was chosen by Nicole, of Bakeologie. After last months pie-laden picks, it was a relief to make something easy, fast, and yet still ridiculously delicious. Peanut butter, gracious as always, made a grand reappearance into my world of baking. Even though the recipe calls for normal peanut butter, all I had on hand was a jar of Peanut Butter & Co's all-natural Cinnamon Raisin Swirl. Since the jar was in danger of being consumed by the spoonful, I had no choice but to use it in the recipe. Also, I replaced the peanuts with walnuts. For the recipe, please visit Nicole's lovely blog by clicking here! Thank you, Nicole. This recipe is definitely worth a repeat. 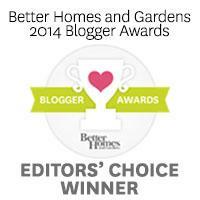 To see how the other Tuesdays with Dorie bakers did, please click here. I've included the recipe for the ganache. You know...just in case. Place the chocolate chips in a heat-proof bowl. In a small sauce pan, bring the cream to a slow, gentle boil. Pour the cream over the chocolate chips and let it stand for about 2 minutes. Whisk in the butter and gently stir until the chocolate and butter are melted and the mixture is smooth. 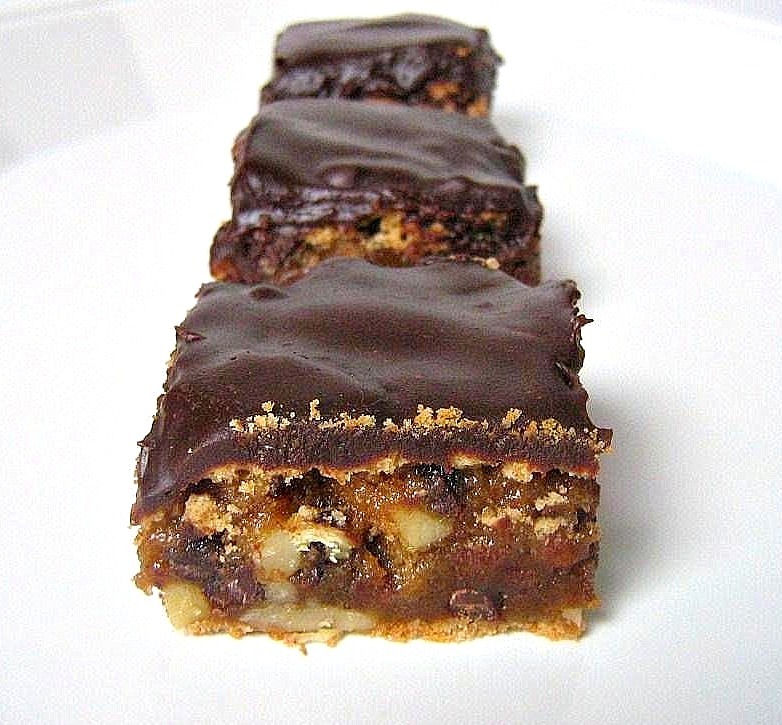 Pour over the blondies and spread into an even layer. Refrigerate until the ganache has hardened slightly. Cut pieces with a knife run under hot water. Valerie, you added ganache! Now I'm going to have to make them again. They look irresistable. Oh my. Gooey, caramelly, chocolate! The devil made Dorie do it! And you followed right along, tempting us all! these look so gooey and delicious, wow! Do you have a certain kind of camera in mind. I've heard that a lot of bloggers love the Canon Rebel while some prefer any Nikon to anything Canon??? Those look terrific! I'm not a huge peanut butter fan, but the rest of my family is. Looks like they're in for a treat! Sorry about your camera. Good luck in replacing it! I love your additions! These look delish. YOWZA! Any recipe described as "lethal" is a recipe I want to try! I like the way you think, that ganache is the perfect touch. So sorry about your camera, I hope you find a suitable replacement. Oh. My. Yum. These look great!! Deadly Deadly Deadly!!! OMG! This is a must try recipe! Thanks for sharing your post and wonderful and sinful photos! I will keep my fingers crossed you will find a spot on someone's boat to cook! 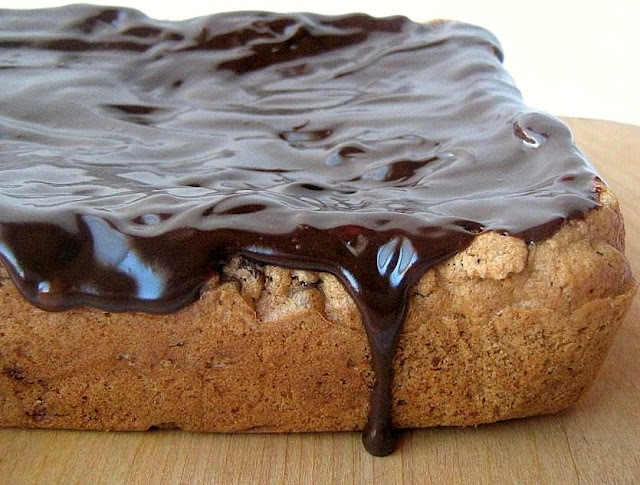 your ganache looks wonderful and shiny and perfect topping for these blondies. Wow I wish I would have thought about adding a chocolate ganache topping. They look outstandingly good! I would have ate the entire pan and felt like crap.! It's certainly not a bad thing that you know about Peanut Lovers' Month, since because of it we get this marvelous recipe! They look incredible. Hey Valerie, I got my fingers crossed for you. I've never bought anything off of E-Bay, so I admire your bravery (smile). 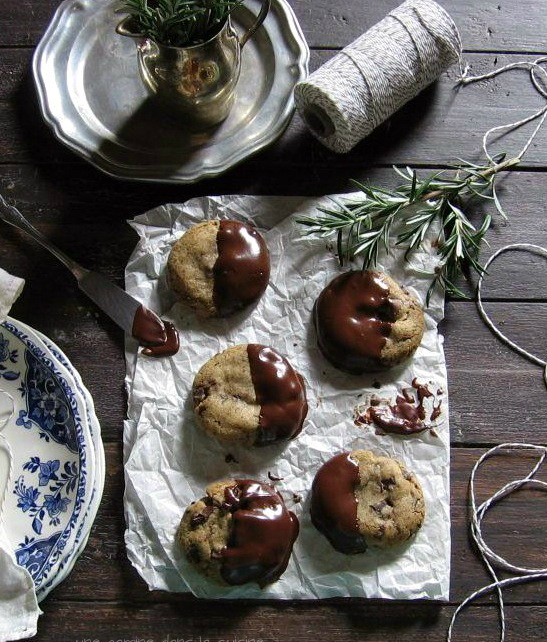 These look so gorgeous that I am really regretting my decision not to bake along this week. In fact, I have already torn through the kitchen cupboards and have found no peanut butter, peanuts, or chocolate, so it doesn't look like I'll be making a last-minute batch either. Tragic news about the camera, but I can't wait to hear how the ebay one works out. Oh, I'm really procrastinating now, but about the spelling. I'm obsessed, so have plans for a spelling/grammar post. Yup, I'm a geeky English teacher! Mary, I think that's a great idea. One can only take so much of Google asking "did you mean...?" OH goodness me! That looks ridiculously delicious!! mmmmm... these look so gooey, dense, and buttery. and what great pictures! Oh my!! I love that you added ganache..that looks amazing! Oh wow - these look ridiculously good! Holy. Moly!! Those look incredible! I wish I could reach through the screen and take one in my hand to have with my tea right now. Terrific idea! I'm confident you will find a camera soon. No doubt about it. Valerie, I'm continually impressed by how often you blog, your wonderful stories, and how you find all this time to cook and blog and write. I can't believe it took me so long to get over here to see your blondies. And I even linked you on mine. You win this week. (I always pick a weekly winner, if just in my mind.) The ganache on top looks heavenly! You like Ganache just like I do :) Easy and very impressive to most, hahaha.